I love shrimp. My sister can't stand the sight/smell/texture of shrimp. My man loves shrimp/chicken/anything edible. 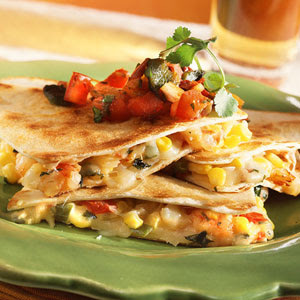 We straddled the fence of likes and dislikes with quesadillas. I bought a rotisserie chicken and shredded it, keeping it separate from all other ingredients. I also kept a little bowl of baby shrimp on the side. 1. Saute the shallot and garlic in olive oil over medium heat. When softend add mushrooms and saute until softened. 2. Place in a large mixing bowl with cilantro, corn, cumin, hot sauce, and stir gently together. 3. In large nonstick pan, melt 1/2 teaspoon of butter over medium heat. Place one large tortilla on pan. Top with a hand full of shredded cheese, mixed goodness and either shrimp, chicken or both. Top with more cheese and another tortilla. Cook for about 5 minutes on each side. Make a personalized quesadilla for everyone around your kitchen table. 4. Slice quesadillas and serve with avocado, tomatoes and sour cream.